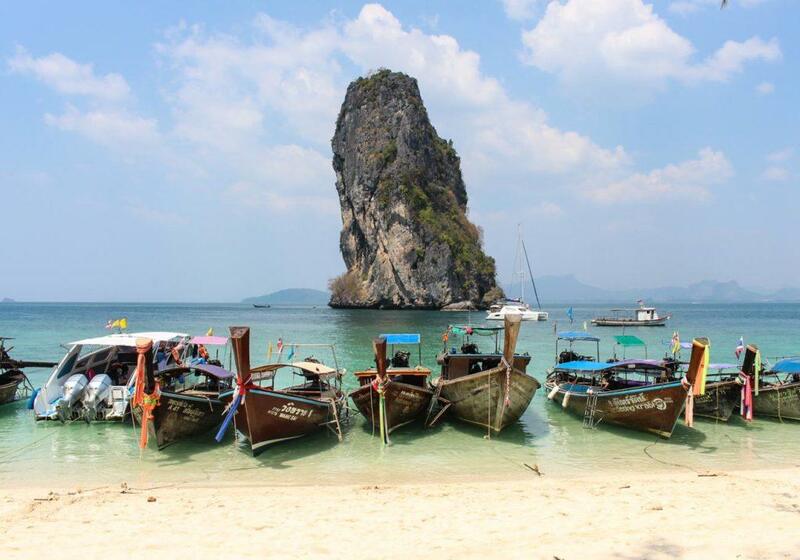 Krabi Province is a very popular destination in Thailand. 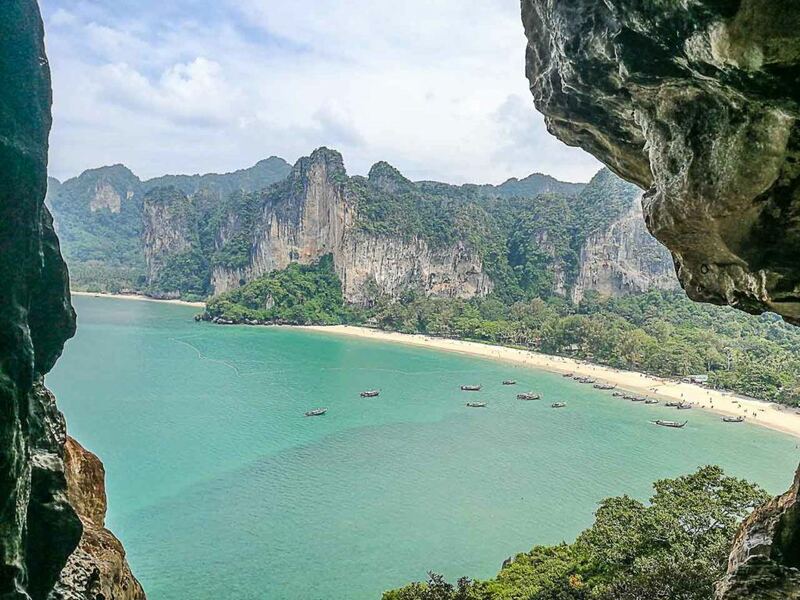 Many travel to Krabi in search of scuba diving or rock climbing, others come to see the natural beauty but most come for the best beaches of Thailand. There are so many things to do in Krabi that you would not want to leave this paradise. At least I haven’t felt like leaving yet. I will try my best to share with you all the information I have about what to do in Krabi, where to stay, places to visit, how to get to and move around. The province has some of the most beautiful islands in Thailand and it’s also the getaway to famous destinations like Phi Phi Island and Koh Lanta. 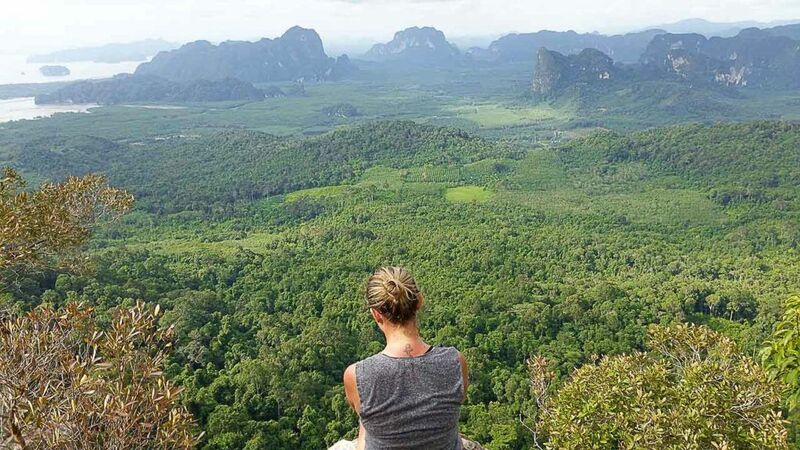 Quite often people don’t have a lot of time to spend in the province (unfortunately) and will choose where to stay in Krabi based on what they are willing to do in Ao Nang, Krabi Town or Railay Beach. Tiger Temple, Emerald Pool and the Hot Springs are all near Krabi Town, so I recommend staying there when you are visiting those places or if you have to catch a flight early in the morning. Krabi Town isn’t really near the beach so I, personally, prefer staying in other places. As you can easily access Krabi Town from anywhere in case you need. In my opinion, Ao Nang is the best area to stay in Krabi when you are willing to stay a bit longer and have that feeling of settling down somewhere for a bit. At least that’s what happened to me. I liked it so much I’ve been here for 6 months already. Ao Nang Beach is quite charming and although it doesn’t seem like there is much to do right there, it’s actually a very strategic place to be as it offers easy access to everything on the list of top things to do in Krabi and around. The opposite also works here. If you have very few days and you only have time for a couple of day trips from Krabi, stay in Ao Nang and go on your day tours from there! Railay Bay offers you the feeling of being on an island because it’s only accessed by boat. Most of the accommodation offered in Railay are resorts, so it could get a bit pricier compared to the other places to stay in Krabi. But it’s worth doing it for a couple of nights so you get to do everything you want there without having to rush yourself to catch the last boat back to Ao Nang, Ao Nam Mao pier or Krabi Town every night [or end up having to charter a boat]. Plus you will get to watch the amazing sunsets at Phra Nang Beach if you stay there. Also located in Railay Bay, Tonsai Beach is a bit harder to access. It’s the favorite destination to those on rock climbing holidays as Tonsai is well known worldwide for being a rock climbing paradise. Accommodation in Tonsai Beach is quite cheap compared to the rest of Railay, but, except for a big resort there, everything is more laid back and most places cut the electricity down during the day, which means no internet, no fan, no air conditioning, etc. It’s rock climbing time baby! Still not sure about where to stay in Krabi? It doesn’t matter if you are looking for accommodation in Ao Nang, a luxury resort in Railay Beach or a cozy and cheap hostel in Krabi Town, the best properties and prices you can find on Booking.com or Agoda. There are so many things to do in Krabi it’s hard to choose only a few. I would recommend you to stay around Krabi for at least 5 days, so you have enough time to enjoy the top attractions in Krabi. But if you can’t stay that long, choose your favorite attractions and places to see in Krabi and make the most of your time. Railay Bay is a tiny little area surrounded by amazing looking cliffs. You will see resorts and massage shops everywhere, so if your plan is just relaxing, then enjoy the white sand and clear waters at Phra Nang Beach or Railay West Beach. Enjoy your resort’s pool, walk around the area, go for a couple of massages and don’t forget to watch the amazing sunsets there. 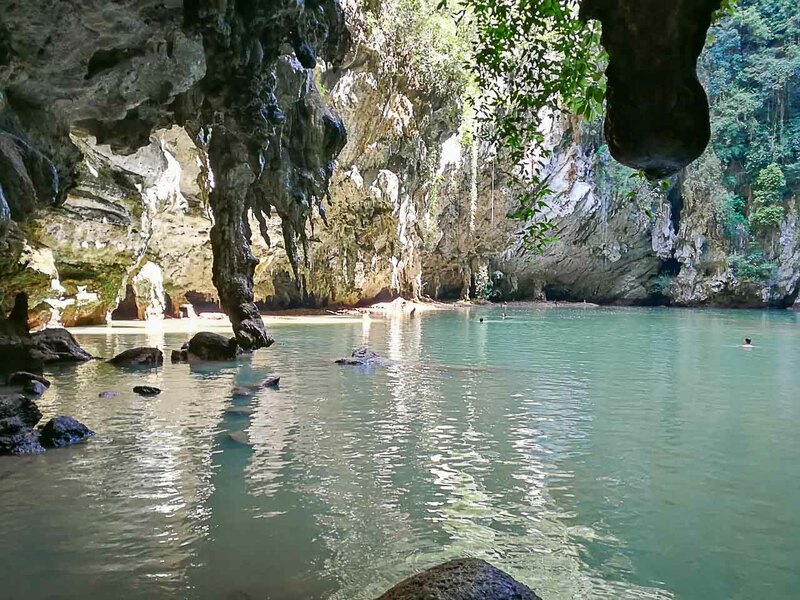 Now if you are seeking some adventure in Krabi, you will find some hidden gems in Railay Beach. You can go kayaking around the small islands and tiny beaches around the bay, just rent a kayak at the beach and enjoy it. Go hiking through some caves and reach a beautiful view point at the North end of Phra Nang beach [opposite to the Princess cave]. This one is a bit hard to find as there are no signs to guide you and nothing about it on Google Maps. When you get to the end of the beach, look to your right and you will see an opening in the trees, follow that path towards the cliff. Start walking over the rocks and into the big opening on the cliff where the cave starts. There are several levels, perhaps different chambers inside of it and they built some bamboo ladders to climb up to the next levels. It will get pitch black inside so take a torch or use your phone to help you. Keep going up the ladders until you start seeing the light again, which leads you to a big opening in the middle of the cliff and a breathtaking view of Railay West Beach and Tonsai Beach. Take loads of photos, turn around and make your way back from where you came from. There is no cost to access the caves. Looking for more adrenaline? There is another viewpoint, which is Railay’s main one. It’s on the way to Princess Lagoon. Follow the pathway between Railay East and Phra Nang Beach and you will find the start point to the hike, this one is a bit tricky, quite dangerous at some points and requires a lot of skills as you will be climbing rocks without safety equipment at some stages. I strongly recommend wearing running or hiking shoes and really old clothes, as they will get all muddy and stained. Take your time and do not even attempt starting it if it looks like it’s going to rain or if it has rained heavily the day before. Keep in mind that the lagoon is influenced by the tides, so plan on arriving there during the highest picks of the tides, otherwise, you will only see a big puddle of mud! Go see it for yourself, it’s completely worth it! There is no cost to access the viewpoint or Princess Lagoon. Last, but not least, go try some outdoor rock climbing. With the incredible landscape, your fear of heights will disappear. It’s so much fun and there are so many guides to help you, even if you’ve never done it before. Look for one of the schools around Railay beach and have fun! This Buddhist temple is one of the most sacred sites in Krabi. 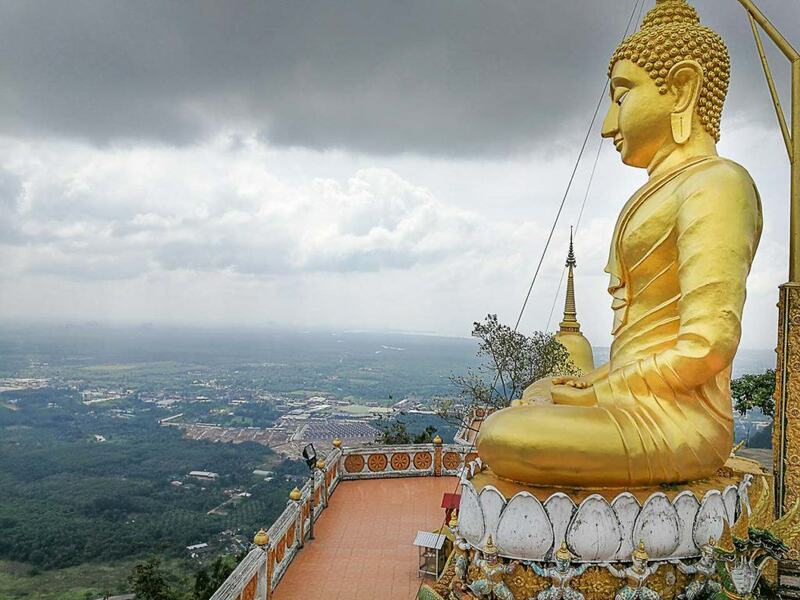 You will get to see tiger paw prints in the cave, lush green trees, a big golden Buddha statue on top of the hill and a staircase with strenuous 1,237 steps leading to the summit. Your legs will be shaking when you get to the top! You need to dress properly at this temple, women are requested to cover their knees and shoulders. There is no cost to access this temple and donations are welcome. What to do in Krabi Town? Go shopping! Krabi Town is the capital of the Province, this is where the international airport is located, where you will find bigger stores, shops and supermarkets. On top of that, they have the biggest weekend night market around, filled with stalls selling all kinds of yummy foods and drinks, lots of really cheap clothes, some souvenirs and other things worth having a look at. There are vans available to drive you from Ao Nang to Krabi night market and back, book it at any travel agency. You can also take a Songthaew (Thai pickup trucks adapted into a shared bus/taxi), just remember that the last one to return to Ao Nang departs from the Krabi night market at 10 pm. Ao Nang is very lively, full of shops, restaurants, hotels, hostels, resorts, spas, dive shops, bars and the beach is a great place to sit down, have a drink and watch the sunset. The beach is quite beautiful, although a bit crowded sometimes. It’s worth saying that the water isn’t really clear like it is out on the islands but the sunset is gorgeous. Ao Nang is a place that fits all budgets. For those who love the ocean, I strongly recommend spending a day scuba diving. Ao Nang is full of diving centers that will take you to the dive sites around the best islands in Krabi. It’s so beautiful, so warm, great visibility and so much fun, that you shouldn’t miss on it. 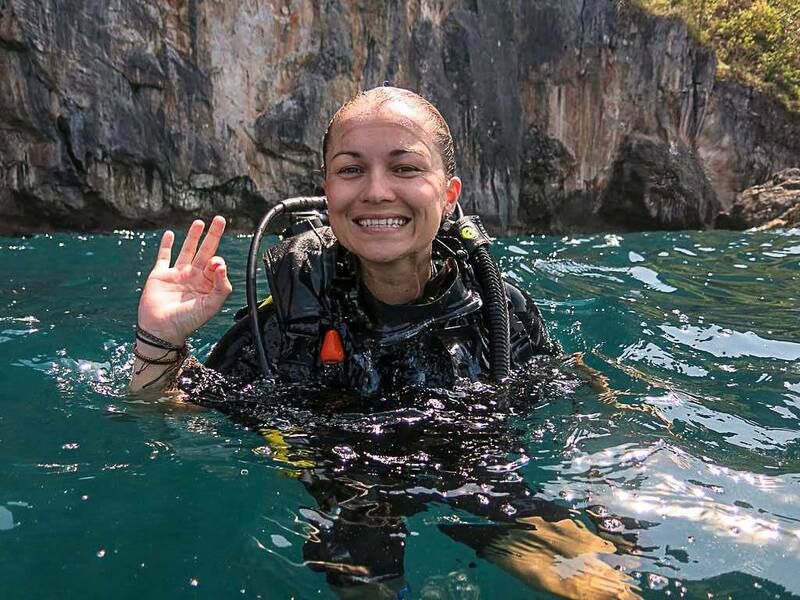 I had an amazing experience with Sawasdee Divers Krabi in Ao Nang. They are very professional and have a great team of divers that speak both English and French. Don’t worry if you are new to the underwater world, they will help you with everything. At night, many small bars and restaurants around town offer live music and great cocktails. A bit later the fun happens in Central Point, which is beach front. You’ve got to find a small alley in between some shops near Burger King. Walk that way and you will a find a square filled with bars, music and many people dancing and having fun. Upstairs there is more, you will find some strip clubs with beautiful Thai ladies, a Ladyboy Cabaret Show and a rooftop where everyone plays beer pong and enjoys the DJ at the dance floor of a party hostel. The partying there ends around 4 am! There are so many boat tours departing from Ao Nang or Krabi Town to the amazing Islands around Krabi that it gets hard to recommend just one. Visit the travel agencies and choose one according to your budget, the time you have available and your taste. Some of the day trips include a visit to the islands, snorkeling, others have kayaking, white water rafting or just island hopping. Krabi is a true water paradise! Rent a scooter or share a taxi with your friends and go on a hiking adventure in Krabi. From Ao Nang Beach it takes about 30 minutes to drive to the Nature Trail. It will take you 3.7 km to reach the summit, which wouldn’t be bad at all if it wasn’t for the 830 meters of elevation. But when you get up there, see the mountains, the sea, all the islands around Krabi and breathe the super fresh air, everything makes sense. It’s so pleasant, so beautiful and so worth it! These spots are near each other and relatively near Tiger Temple, and some day tours from Krabi Town or Ao Nang include the three of them. They are beautiful and completely natural spots, and although lots of tourists visit these places daily, they are hardly ever over crowded. 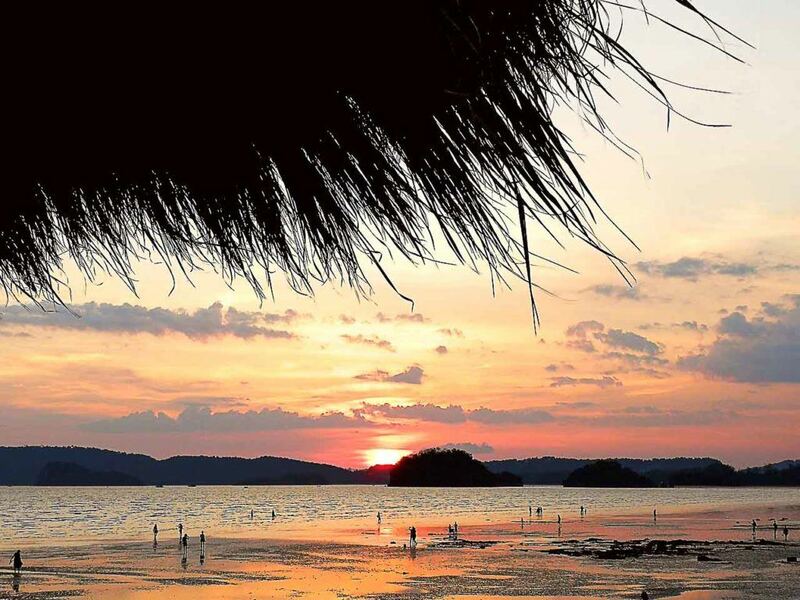 It’s a great option to relax in Krabi and spend some time in contact with nature. 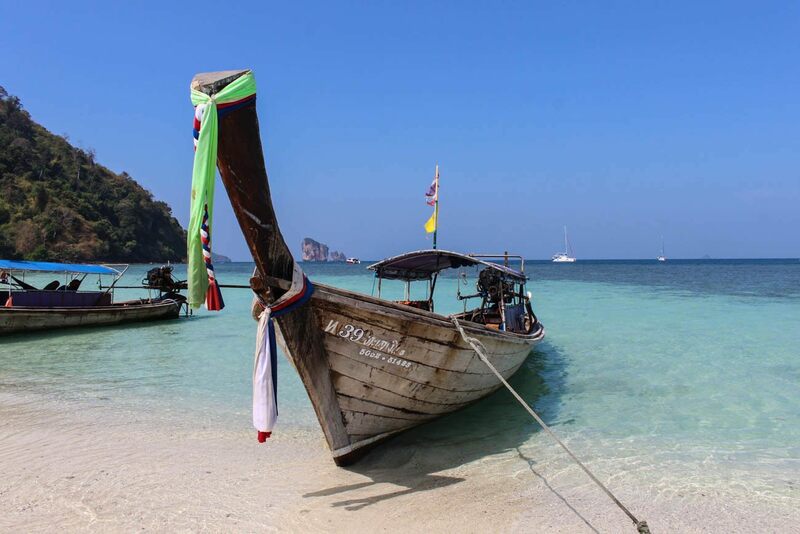 By now you already know all the must-do in Krabi, attractions and things to do in Ao Nang and Railay Beach, now to end our Krabi travel guide let’s talk about transportation and weather. Krabi Province is located on the southwest coast of Thailand and has an international airport. So how to get to Krabi? A flight from Bangkok to Krabi Town takes about 1 hour and 20 minutes, from Chiang Mai to Krabi it takes just over 2 hours and from Kuala Lumpur it also takes about 1 hour and 20 minutes. If you happen to be on Phuket, you may come to Krabi by speedboat, by bus or by van. Also there are buses to Krabi available all over the country. But it doesn’t matter where you are coming from, if you are not flying, the best way to buy your ticket to Krabi is using the 12GoAsia website. It’s a platform with all the timetables and prices for buses, trains, vans and ferry operating across Thailand. On the website you can buy the “joint ticket”, a single ticket that combines multiple means of transport. You choose the place of departure and the final destination, with one ticket you can catch bus, trains, vans and ferries if necessary. It’s easy, fast and reliable, plus it’s all in English. 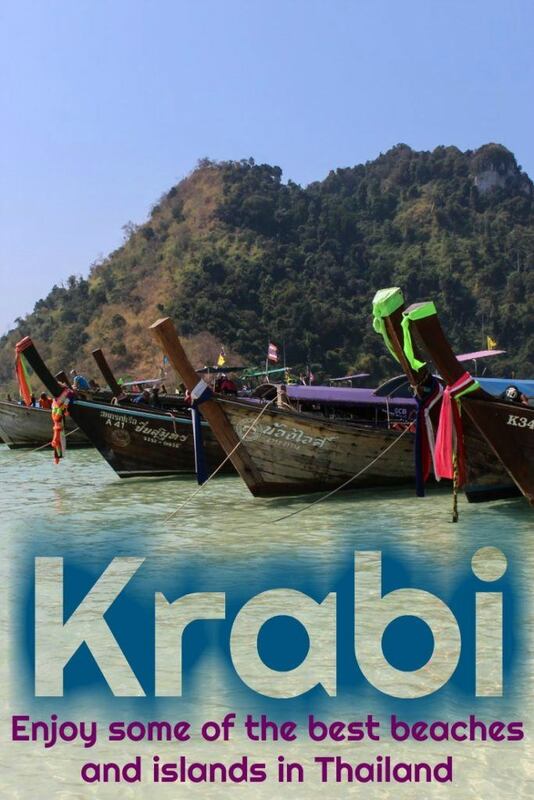 Check the timetables and buy your ticket to Krabi here! Most people will arrive in Krabi Town and then move to the other places in Krabi from there. Here are some tips on how to get around Krabi. – From Krabi airport to Krabi Town or Ao Nang Beach: still inside the airport you can take a bus or van that will drop you off at your hotel for about 150 Baht. They only work from about 7 am to 10 pm so if you need a taxi don’t expect to find meter taxis, they will charge you around 500 to 600 Baht to take you from Krabi Airport to Ao Nang Beach. – From Krabi Town to Ao Nang Beach or Ao Nam Mao pier: you can catch a local bus from the bus terminal (or ask a local where the bus stops are) for 20 Baht. Or jump on any Songthaew (Thai pickup trucks adapted into a shared bus/taxi), they pick you up anywhere along their route, just lift your hand on the side of the road and get inside, when you arrive where you want to, just push the stop button, get off the vehicle and go see the driver to pay for your ticket, 60 Bath. You can also take taxis for about 500 Baht or rent a scooter for around 250 Baht per day. – From Krabi Town to Railay Beach: catch any transportation to Ao Nang and ask to be dropped off at Ao Nam Mao Pier. There you will catch a long tail boat for 100 Baht and will be dropped off at Railay East pier. The boats depart every hour on the half, starting at 8:30 am and ending at 6:30 pm, it takes about 15 minutes to arrive in Railay Beach. You can charter a boat for 800 Baht and depart at any time. – From Ao Nang Beach to Railay or Tonsai Beach: walk to the beach, and where the main road meets the beach road, next to Ao Nang Traffic Police Box there is a little office where you buy the tickets (you can only go to Tonsai Beach from Ao Nang Beach or Noppharat Thara Beach). Tickets cost 100 Baht and boats depart at any time, as long as there are 8 people going. If you want to charter one it will cost you 800 Baht. 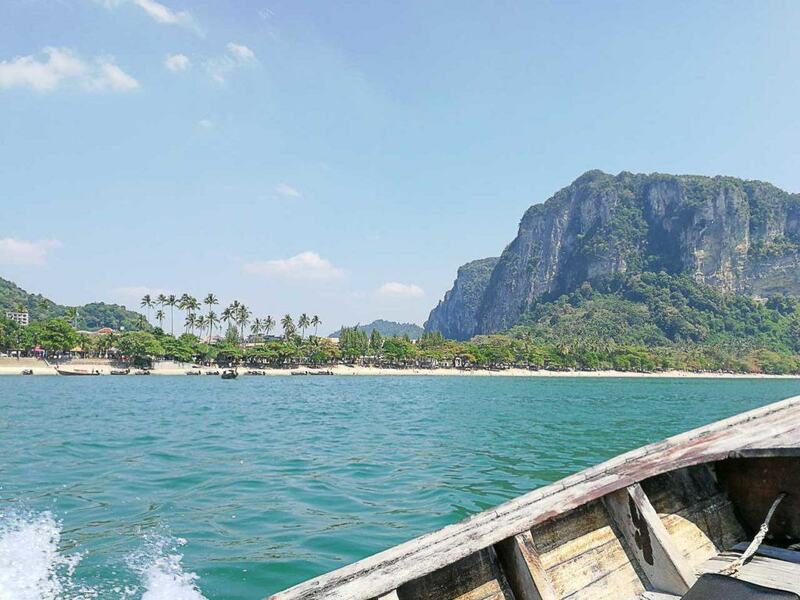 – From Noppharat Thara Beach to Railay or Tonsai Beach: walk to the beach, find the boat drivers and tell them where you are going. It works the same way as in Ao Nang Beach. – From Krabi Town / Ao Nang or Railay Beach to Koh Lanta / Phi Phi Island or Phuket: you can buy your ‘joint ticket in advance’ on the website 12GoAsia up to one day in advance. If your hotel is far from the pickup point, you might need to book a taxi or a transfer, talk to your hotel reception or go to any travel agency, most of them have quite similar prices. Tickets are easily available all the time [except on the main holidays] and you can buy them at the last minute, obviously, if you are taking the first ferry in the morning and need to be picked up at your hotel, you need to buy your ticket the night before. There is a travel agency in Ao Nang Beach I buy all my tickets from, it’s called MacNetTour and it’s across the street from Bluesotel Krabi Hotel, a bit down towards the beach. It’s owned by a sweet Thai couple that is always willing to help you very patiently. Their prices are great and they also offer internet and printing services. It’s always a good time to visit Krabi, but February and March are my favorite months. The weather in Krabi is quite pleasant all year around. The high season starts in November and goes all the way to March. The busiest months are December and January which aren’t the hottest [still pretty warm though, an average of 28ºC]. Then in February, it starts to get warmer and warmer until April when the average is 33ºC. Great temperatures to swim all day. From mid April on, the monsoon season starts, but usually it rains once a day, not for long, with some exceptions. From May on, some of the business shut down for the low season and re-open around September. 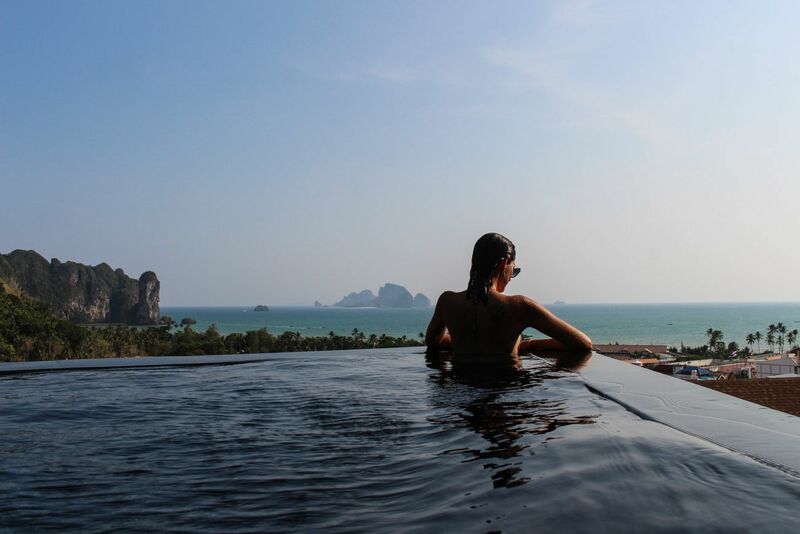 By now you’ve got all the information you need about the places to visit in Krabi, what to do, where to stay and how to move around here. So I hope you make the most of your trip and see the best of Krabi, as this place is just amazing! Phi Phi is one of the most sought-after island destinations in this country. Phi Phi is easily accessible with the aid of excellently ferry services.